Kirby Trailer For Switch, Release Date 2018 | Nerd Much? Kirby, an old time favorite for a lot of Nintendo fans, coming to the Switch sometime in 2018, as Nintendo announced at their Treehouse E3 event this year. The trailer showed a little gameplay, featuring the characters that will be in the game, the enemies, and some of Kirby’s new moves. He gives hearts to enemies in the trailers and wears a very cute Link hat, from The Legend of Zelda. 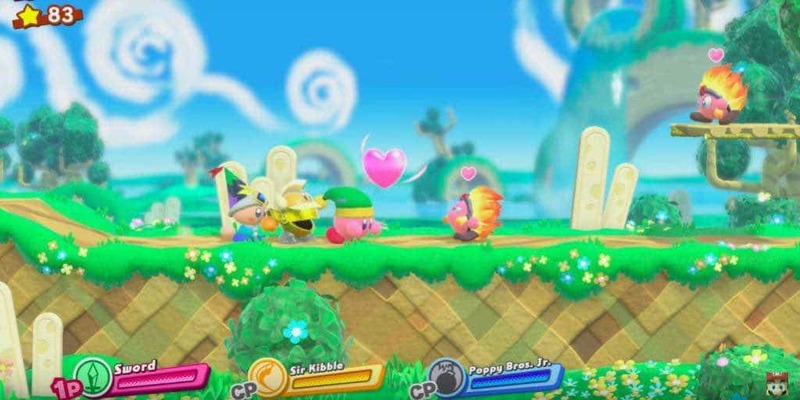 Kirby used to eat enemies to assume their abilities, but it seems that what too exciting for Nintendo, so they changed it Kirby befriending his enemies and allowing them to join the player’s team. Who knows what this means for future Nintendo games, if they are kid-proofing all their titles, or just Kirby and Yoshi. Whether these members are NPCs or part of the multiplayer mode is yet to be seen. Each enemy has their own powers and moves to aid Kirby on his journey. The player can even assemble them for one powerful attack. As the Switch very much promotes couch co-op by design, Kirby will more than likely have the multiplayer feature, whether it was shown in the trailer or not. However it is yet to be confirmed.